^ “Mechanisms of CD4+ T lymphocyte cell death in human immunodeficiency virus infection and AIDS”. J. Gen. Virol. 84 (7): 1649–1661. (2003). doi:10.1099/vir.0.19110-0. PMID 12810858. ^ Lévy, J. A. (1993). “HIV pathogenesis and long-term survival”. AIDS 7 (11): 1401–10. doi:10.1097/00002030-199311000-00001. PMID 8280406. ^ Smith, Johanna A.; Daniel, René (Division of Infectious Diseases, Center for Human Virology, Thomas Jefferson University, Philadelphia) (2006). “Following the path of the virus: the exploitation of host DNA repair mechanisms by retroviruses”. ACS Chem Biol 1 (4): 217–26. doi:10.1021/cb600131q. PMID 17163676. ^ Martínez, edited by Miguel Angel (2010). RNA interference and viruses : current innovations and future trends. Norfolk: Caister Academic Press. p. 73. ISBN 978-1-904455-56-1. https://books.google.com/books?id=C5TY8W74scIC&pg=PA73. ^ Gerald B. Pier, ed (2004). Immunology, infection, and immunity. Washington, D.C.: ASM Press. p. 550. ISBN 978-1-55581-246-1. https://books.google.com/books?id=kBb-wYsMHEAC&pg=PA550&lpg=PA550. ^ a b c “Hybrid Spreading Mechanisms and T Cell Activation Shape the Dynamics of HIV-1 Infection”. PLOS Computational Biology 11 (4): e1004179. (2015). doi:10.1371/journal.pcbi.1004179. PMID 25837979. ^ “HIV-1 cell to cell transfer across an Env-induced, actin-dependent synapse”. Journal of Experimental Medicine 199 (2): 283–293. (2004). doi:10.1084/jem.20030648. PMID 14734528. 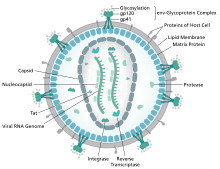 ^ “Avoiding the void: cell-to-cell spread of human viruses”. Nature Reviews Microbiology 6 (11): 815–826. (2008). doi:10.1038/nrmicro1972. PMID 18923409. ^ “Cell-to-cell spread of HIV permits ongoing replication despite antiretroviral therapy”. Nature 477 (7362): 95–98. (2011). doi:10.1038/nature10347. PMID 21849975. ^ Gilbert, PB et al. (February 28, 2003). “Comparison of HIV-1 and HIV-2 infectivity from a prospective cohort study in Senegal”. Statistics in Medicine 22 (4): 573–593. doi:10.1002/sim.1342. PMID 12590415. ^ Reeves, J. D.; Doms, R. W (2002). “Human Immunodeficiency Virus Type 2”. J. Gen. Virol. 83 (Pt 6): 1253–65. doi:10.1099/vir.0.18253-0. PMID 12029140. ^ a b c “Current status of HIV infection: a review for non-HIV-treating physicians”. Int J Dermatol 46 (12): 1219–28. (2007). doi:10.1111/j.1365-4632.2007.03520.x. PMID 18173512. ^ Mandell, Bennett, and Dolan (2010). Chapter 118. ^ a b “HIV-1 infection in rural Africa: is there a difference in median time to AIDS and survival compared with that in industrialized countries?”. AIDS 16 (4): 597–632. (2002). doi:10.1097/00002030-200203080-00011. PMID 11873003. ^ (PDF) Progression and mortality of untreated HIV-positive individuals living in resource-limited settings: update of literature review and evidence synthesis. UNAIDS Obligation HQ/05/422204. (2006). オリジナルのApril 9, 2008時点によるアーカイブ。. http://data.unaids.org/pub/Periodical/2006/zwahlen_unaids_hq_05_422204_2007_en.pdf 2008年3月19日閲覧。. ^ a b Antiretroviral Therapy Cohort Collaboration (2008). “Life expectancy of individuals on combination antiretroviral therapy in high-income countries: a collaborative analysis of 14 cohort studies”. Lancet 372 (9635): 293–9. doi:10.1016/S0140-6736(08)61113-7. PMC: 3130543. PMID 18657708. https://www.ncbi.nlm.nih.gov/pmc/articles/PMC3130543/. ^ Schackman BR, Gebo KA, Walensky RP, Losina E, Muccio T, Sax PE, Weinstein MC, Seage GR 3rd, Moore RD, Freedberg KA. (2006). “The lifetime cost of current HIV care in the United States”. Med Care 44 (11): 990–997. doi:10.1097/01.mlr.0000228021.89490.2a. PMID 17063130. ^ a b c d Vogel, M; Schwarze-Zander, C; Wasmuth, JC; Spengler, U; Sauerbruch, T; Rockstroh, JK (July 2010). “The treatment of patients with HIV”. Deutsches Ärzteblatt international 107 (28–29): 507–15; quiz 516. doi:10.3238/arztebl.2010.0507. PMC: 2915483. PMID 20703338. https://www.ncbi.nlm.nih.gov/pmc/articles/PMC2915483/. ^ van Sighem, AI; Gras, LA; Reiss, P; Brinkman, K; de Wolf, F; ATHENA national observational cohort, study (June 19, 2010). “Life expectancy of recently diagnosed asymptomatic HIV-infected patients approaches that of uninfected individuals”. AIDS (London, England) 24 (10): 1527–35. doi:10.1097/QAD.0b013e32833a3946. PMID 20467289. ^ Smith, [edited by] Blaine T. (2008). Concepts in immunology and immunotherapeutics (4th ed.). Bethesda, Md. : American Society of Health-System Pharmacists. p. 143. ISBN 978-1-58528-127-5. https://books.google.com/books?id=G46DrdlxNJAC&pg=PA143. ^ a b Cheung, MC; Pantanowitz, L; Dezube, BJ (Jun–Jul 2005). “AIDS-related malignancies: emerging challenges in the era of highly active antiretroviral therapy”. The oncologist 10 (6): 412–26. doi:10.1634/theoncologist.10-6-412. PMID 15967835. ^ “The impact of host genetics on HIV infection and disease progression in the era of highly active antiretroviral therapy”. AIDS 17 (Suppl 4): S51–S60. (2003). doi:10.1097/00002030-200317004-00006. PMID 15080180. ^ Lawn SD (2004). “AIDS in Africa: the impact of co-infections on the pathogenesis of HIV-1 infection”. J. Infect. Dis. 48 (1): 1–12. doi:10.1016/j.jinf.2003.09.001. PMID 14667787. ^ Campbell GR; Pasquier E; Watkins J et al. (2004). “The glutamine-rich region of the HIV-1 Tat protein is involved in T-cell apoptosis”. J. Biol. Chem. 279 (46): 48197–48204. doi:10.1074/jbc.M406195200. PMID 15331610. ^ “The C terminus of HIV-1 Tat modulates the extent of CD178-mediated apoptosis of T cells”. J. Biol. Chem. 280 (46): 38376–39382. (2005). doi:10.1074/jbc.M506630200. PMID 16155003. ^ Pennsylvania, Editors, Raphael Rubin, M.D., Professor of Pathology, David S. Strayer, M.D., Ph.D., Professor of Pathology, Department of Pathology and Cell Biology, Jefferson Medical College of Thomas Jefferson University Philadelphia, Pennsylvania ; Founder and Consulting Editor, Emanuel Rubin, M.D., Gonzalo Aponte Distinguished Professor of Pathology, Chairman Emeritus of the Department of Pathology and Cell Biology, Jefferson Medical College of Thomas Jefferson University, Philadelphia, (2011). Rubin's pathology : clinicopathologic foundations of medicine (Sixth ed.). Philadelphia: Wolters Kluwer Health/Lippincott Williams & Wilkins. p. 154. ISBN 978-1-60547-968-2. https://books.google.com/books?id=wb2TzY9AgJ0C&pg=PA154. ^ Woods, S.; Moore, D.; Weber, E.; Grant, I. (2009). “Cognitive neuropsychology of HIV-associated neurocognitive disorders”. Neuropsychology review 19 (2): 152–168. doi:10.1007/s11065-009-9102-5. PMC: 2690857. PMID 19462243. https://www.ncbi.nlm.nih.gov/pmc/articles/PMC2690857/. ^ Brown, T.; Qaqish, R. (2006). “Antiretroviral therapy and the prevalence of osteopenia and osteoporosis: a meta-analytic review”. AIDS (London, England) 20 (17): 2165–2174. doi:10.1097/QAD.0b013e32801022eb. PMID 17086056. ^ Nicholas, P.K. ; Kemppainen, J.K.; Canaval, G.E. et al. (February 2007). “Symptom management and self-care for peripheral neuropathy in HIV/AIDS”. AIDS Care 19 (2): 179–89. doi:10.1080/09540120600971083. PMID 17364396. ^ “AIDS-related malignancies”. Nature Reviews Cancer 2 (5): 373–382. (2002). doi:10.1038/nrc797. PMID 12044013. ^ “Therapy insight: AIDS-related malignancies – the influence of antiviral therapy on pathogenesis and management”. Nat. Clin. Pract. Oncol. 2 (8): 406–415. (2005). doi:10.1038/ncponc0253. PMID 16130937. ^ Post, F. .; Holt, S. . (2009). “Recent developments in HIV and the kidney”. Current opinion in infectious diseases 22 (1): 43–48. doi:10.1097/QCO.0b013e328320ffec. PMID 19106702. ^ a b “Prolongation and quality of life for HIV-infected adults treated with highly active antiretroviral therapy (HAART): a balancing act”. J. Antimicrob. Chemother. 61 (3): 469–73. (March 2008). doi:10.1093/jac/dkm499. PMID 18174196. http://jac.oxfordjournals.org/cgi/pmidlookup?view=long&pmid=18174196. ^ Gusa, Aa; Buller, Rs; Storch, Ga; Huycke, Mm; MacHado, Lj; Slater, Ln; Stockham, Sl; Massung, Rf (Jul 2006). “Chimpanzee reservoirs of pandemic and nonpandemic HIV-1.” (Free full text). Science 313 (5786): 523-6. PMC: 2442710. PMID 16728595. http://www.ncbi.nlm.nih.gov/pmc/articles/PMC2442710/?tool=pubmed. DeMaria A Jr, Ridzon R; Ciesielski, K; Ginsberg, C; Robertson, MB; Luo, BJ (1997). “Simultaneous Transmission of Human Immunodeficiency Virus and Hepatitis C Virus from a Needle-Stick Injury”. N Engl J Med (336): 919-22. http://content.nejm.org/cgi/content/full/336/13/919. Jo, Kahn; Walker, BD (1998). Acute human immunodeficiency virus type 1 infection. 33-39. http://content.nejm.org/cgi/content/extract/339/1/33. Mandell, Gerald L.; Bennett, John E.; Dolin, Raphael, eds (2010). Mandell, Douglas, and Bennett's Principles and Practice of Infectious Diseases (7th ed.). Philadelphia, PA: Churchill Livingstone/エルゼビア. ISBN 978-0-443-06839-3. Joint United Nations Programme on HIV/AIDS (UNAIDS) (2011). Global HIV/AIDS Response, Epidemic update and health sector progress towards universal access. 国際連合エイズ合同計画. http://www.unaids.org/en/media/unaids/contentassets/documents/unaidspublication/2011/20111130_UA_Report_en.pdf.